Real world practice environment against a real shuffle machine. User definable shuffles. Define virtually any casino shuffle in the world. 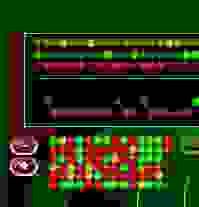 The shuffle engine delivers an endless series of non-repeating shoes. With 72 levels of progression you should be able to define any variation of Flat Bet Progression type betting. 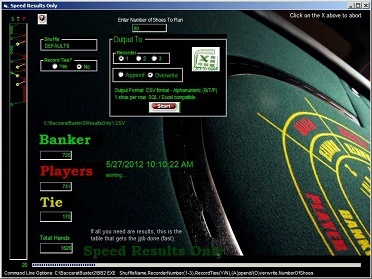 Setup a 111224488 bet system with one click. 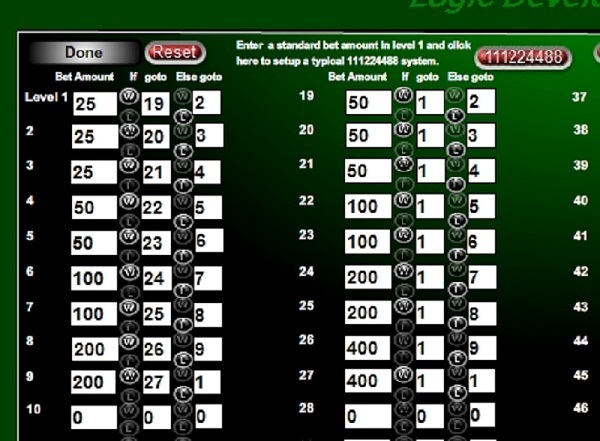 Enter the starting bet and click the 111224488 button. 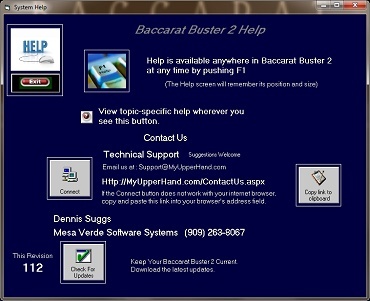 If you are looking for a real world testing environment, this is the software that gets the job done. You are playing against actual shuffles so you get an endless series of non-repeating shoes. This software shuffles the cards. Single-click programming of avatars. 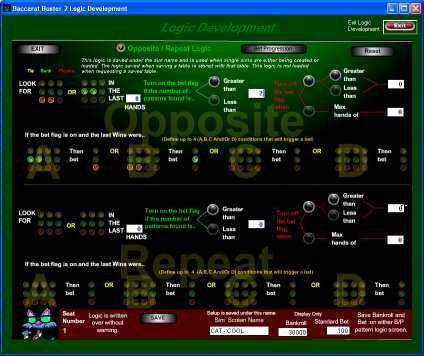 Program an avatar to play your logic and seat it at the high-speed testing table. 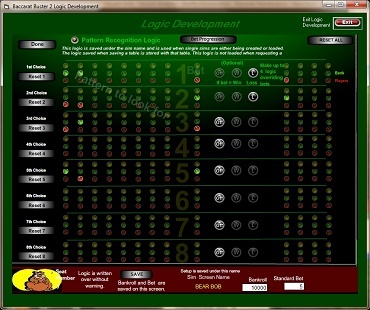 You can program a variety of different logics. Opposite-repeat two step pattern recognition where a bet flag is raised when the first pattern is recognized then a bet is made if it finds a second pattern while the bet flag is raised. Balanced play where the system watches for a defined imbalance in the ratio of B/P wins. Include either of two types of bet progression. Standard multiply, divide, add, subtract or fixed amount based on W/L pattern. Now supports all variations of flat 1326 / 111224488 type progression systems. 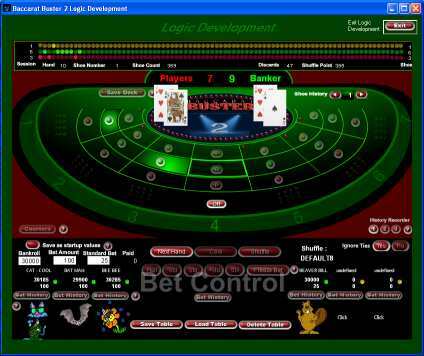 A two pattern conditional bet. A match on the first pattern raises the Bet Flag then if it finds pattern two and the Bet Flag is still on, a bet is made. 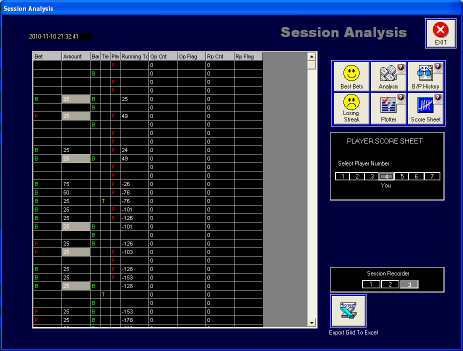 If what you need is B/T/P results only for outside-the-program analysis, this is the screen that will do it for you fast. Depending on your computer, this screen will produce 10,000 to 24,000 hands per minute. Cards are dealt from a shoe and shuffled at the end of each shoe. Output goes to a .CSV file, 1 shoe per row. Open the output file by clicking the Excel icon or import the results directly into SQL. Simple drag and drop shuffle definition. 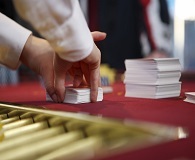 Describe the dealer shuffle steps and save it. 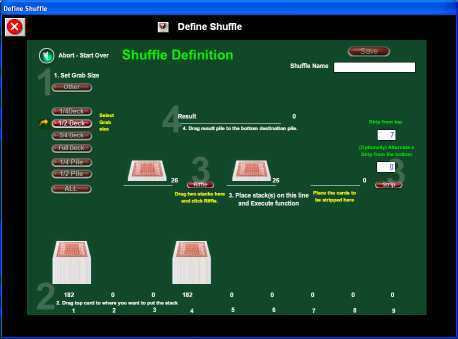 Define any casino shuffle and practice against that shuffle. Find any pattern and plot where it occurred in every shoe. Score sheet for any player position. Tracks side bet, bet amount, running total, side won. Wins are highlighted. Grid can be exported to Excel. Free minor revision upgrades for life.